Ug Plast’s multi-wall polycarbonate sheets are made of strong yet lightweight thermoplastic synthetic resin that provides a durable, translucent solution for applications where impact resistance and light transmission are key. 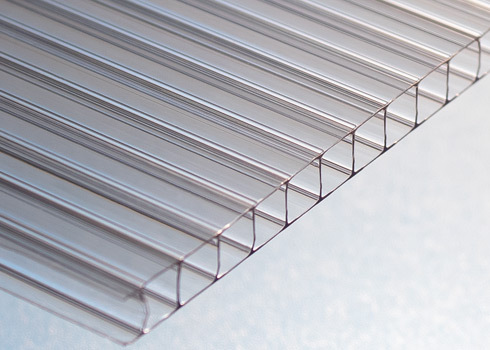 These features plus its distinctive interior structure and light-transmitting properties make multi-wall polycarbonate perfect for unique architectural designs and glazing applications, as well as conventional construction uses. Ug Plast’s multi-wall polycarbonate sheets come with UV protection and a 10 year warranty. Our sample kit is only a click away! Ug Plast only fulfills samples requests made by distributors. Please contact your local distributor for assistance. Our complete sample kit is only a click away! Ug Plast Inc. supplies distributors that serve a variety of industries, including architectural design and construction, signage and displays, medical and consumer products, industrial packaging, and OEM markets.